A domestic version of this product is also available for $2,499.00. 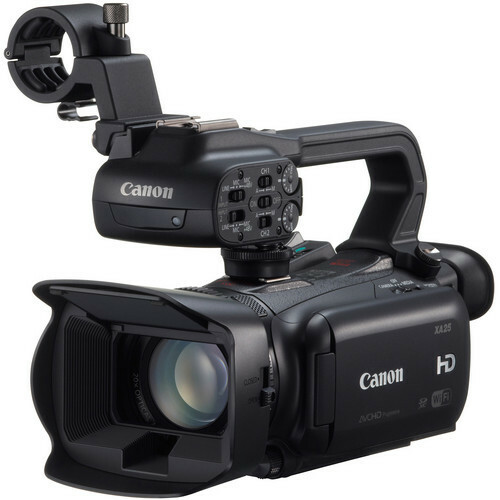 The Canon XA25 Professional HD Camcorder is a compact "run-and-gun" camera that is suitable for ENG, event coverage, independent and documentary filmmaking. The camera features a 1/2.84", 1920 x 1080 CMOS sensor that captures video at various frame rates up to 59.94p, including a 24p mode for a more cinematic feel. 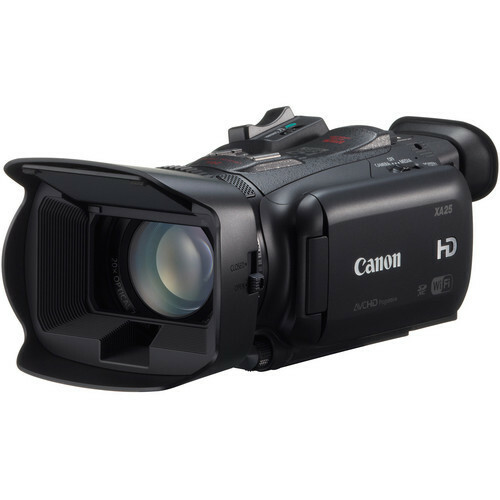 The integrated Canon 20x HD Optical zoom lens has a 35mm equivalent zoom range of 26.8 to 576mm and features an 8-bladed iris to render highlights in a more natural manner. The XA25 features both a 3.5" OLED Touch Panel view screen with a 10,000:1 contrast ratio, and a color electronic viewfinder with 1,560,000 dots of resolution. The camera features full manual control and auto modes for exposure, focus, white balance, gain, and shutter speed. The camera provides professional features such as a pre-record buffer, peaking, zebra bars, color bars, and reference tone. The zoom speed is adjustable with variable, constant (with 16 different speed levels), fast, normal and slow settings. 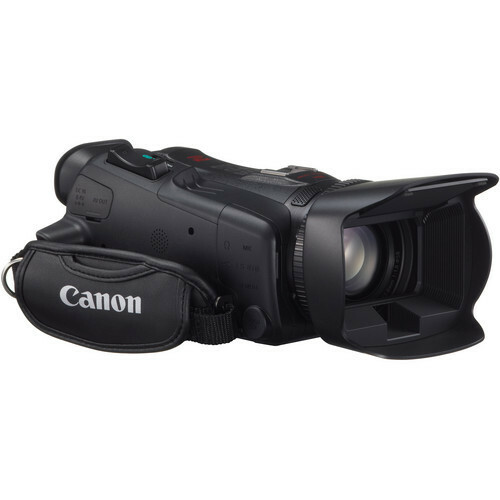 The camera features a detachable top handle with zoom toggle, record start/stop, IR emitter, tally light, accessory shoe, external mic holder and two XLR connectors with phantom power and manual audio level controls. The XA25 includes a built-in headphone jack and an HDMI mini connector, and outputs composite video and audio via a 3.5 mm four pole mini jack. 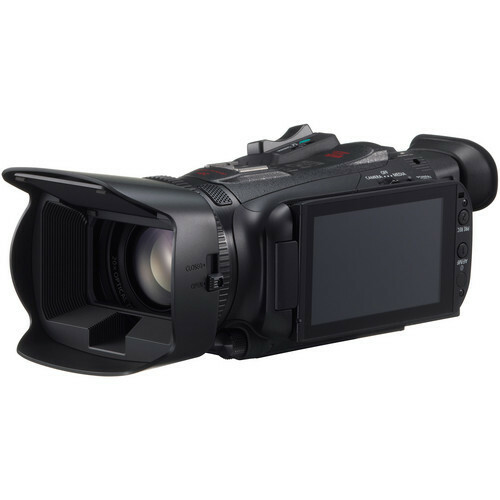 The XA25 also features a built-in SD/HD-SDI output with embedded audio and time code via a BNC connector. The XA25 features a new 1/2.84-inch HD CMOS Image Sensor with 2.91 Mp. The large size of the individual pixels enable a minimum subject illumination of 1.2 lux for shooting in low-light conditions. The XA25 offers optical image stabilization (IS) useful for reducing image blur in a wide variety of shooting situations. Additional IS modes can be manually selected to enhance the optical image stabilization, or you can select Intelligent IS and allow the camera to identify the appropriate stabilization mode for the situation. The XA25 features selectable manual/automatic control on the camera functions, allowing you to choose the best settings for the situation. 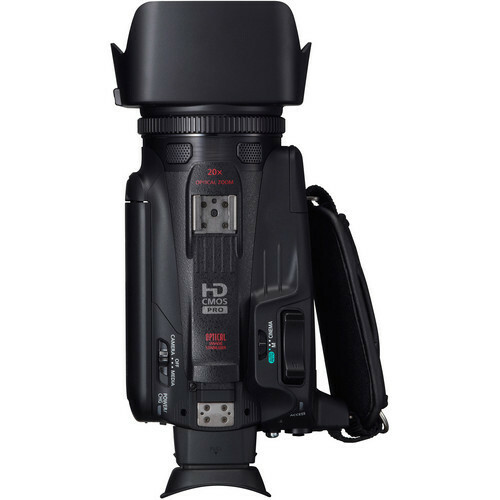 Functions include: Exposure, Shutter Speed, Iris, Gain, Exposure Lock, AGC Limit. 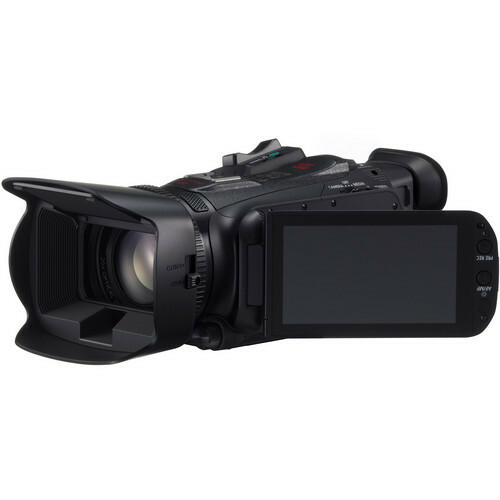 The XA25 features an AV mini terminal for composite video (and audio) via a four pole 3.5 mm mini jack, a mini HDMI out connector which delivers video, audio and allows you the option of superimposing timecode over your video. 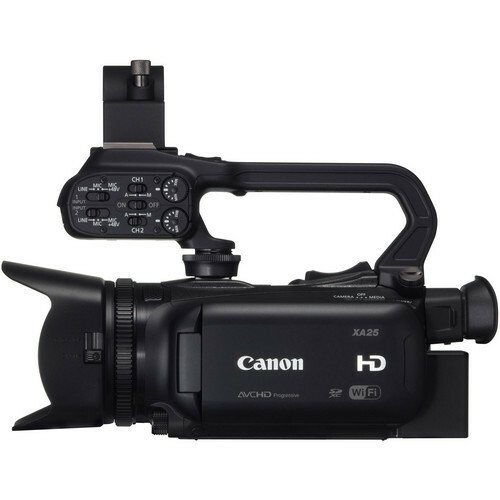 SD/HD-SDI and timecode is available via the BNC connector on the side of the camera. Relay recording: the XA25 automatically switches video recording from one memory card to the other when the first memory card becomes full. The XA25 is compatible with the optional Canon WM-V1 Wireless Bluetooth Microphone. This feature allows high-quality audio to be recorded from up to 164 feet away (50m), making it ideal for events, ceremonies, nature recording and other situations that call for unobtrusive sound recording. With optional earphones attached, the WM-V1 Wireless Microphone can also be used as a two-way intercom. Photo capture: The XA25 offers the ability to capture 1920 x 1080 still images. Photos may be captured to an SD memory card during recording, as well as "frame grabbed" during playback. 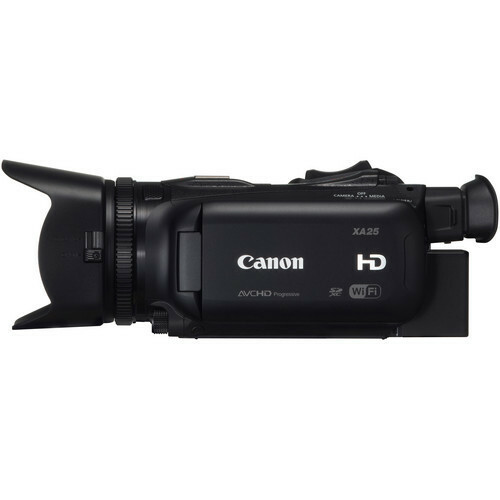 Pre-record: The XA25 continuously buffers approximately three seconds of video in memory. When you begin recording the contents of the buffer memory are added allowing you to capture footage before you pressed record. 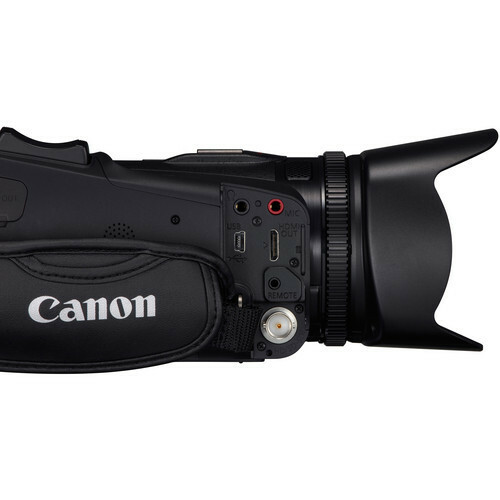 Intelligent battery system: The XA25 is compatible with Canon's Intelligent Lithium-ion batteries, which communicate remaining running time (down to the minute) to the user. Language support: The XA25 supports 27 languages: Czech, Danish, German, Greek, English, Spanish, French, Italian, Hungarian, Malay, Dutch, Norwegian, Polish, Portuguese, Romanian, Finnish, Swedish, Turkish, Russian, Ukrainian, Arabic, Farsi, Thai, Chinese (simplified characters), Chinese (traditional characters), Korean and Japanese. Box Dimensions (LxWxH) 11.0 x 10.7 x 8.6"